A good, old-fashioned 1911 is a great firearm that everyone can appreciate. But there’s no denying that it has some heavy criticism nowadays, especially when compared to modern firearms which don’t suffer from the same design flaws that were common back in the early 20th century. With the right accessories and upgrades, you can make your 1911 a truly amazing firearm that can hold its own against the best of the newer models. In this guide, we’ll look at what upgrades you should consider if you want to boost your 1911’s accuracy and overall performance. The 1911 has been around for over a century! Not many firearms can lay claim to that kind of long lifespan and popular use. And it’s not a collectible or only resting on museum shelves. No, the 1911 is still an excellent pistol, but there’s no denying that it faces a lot of tough competition from more modern guns that can easily take advantage of technological advancements. Adding some sweet accessories or upgrades to your 1911 is a great way to bring the weapon into the 21st century. Since the 1911 is so popular, the good news is that you’ll be able to find a plethora of awesome attachments and upgrades. It’s a great gun by itself, but upgrades can make a good 1911 a beast in its own right, even when compared to modern day weapons. Many of these enhancements come from law enforcement or civilian experimentation, so there’s sure to be something for everyone no matter your intended use. When you do think about getting some upgrades, it’s a good idea to put together a general plan or wish list and make sure everything can go on the gun together. Nothing would be worse than buying two attachments only to find out that they’re mutually exclusive! For the best results, figure out what parts of your 1911 you want to improve the most and work up from there. Let’s get into some of the best upgrades you could add to your personal 1911. We’ll examine each type in detail, then provide a phenomenal example of an attachment so that you’ll know what to look for. Grip will affect your handling of the 1911 more than you might think. It can affect your accuracy and stability as you pull off rapid shots and will also make the weapon easier or harder to drop when in inclement weather. Improving your grip is a great passive benefit that anyone can appreciate. These are fantastic grip panels that you can attach very easily either yourself or with the help of a gunsmith. The grips are made to work with ambidextrous safeties, which is something you don’t see in many grips, and have diamond-shaped cross-sections. These are designed to be very easy to hold and dig into your palms as you hold the weapon. This will aid you when you’re trying to hold it as it fires and can provide some great tension if it’s raining or your palms become sweaty. A gun that slips out of your hands is a sizable danger, so we’re glad to see this protective functionality in the grip pieces. There’s an aggressive magazine drop cut out of the grips, though we noticed that you might need to trim it a little more yourself, depending on its condition upon arrival. However, we feel that this is really just a minor flaw since you can get these grips in four colors for a very reasonable asking price and for a minimum of installation trouble. They’re an excellent pair of grip panels that can improve anyone’s 1911 by a large degree. 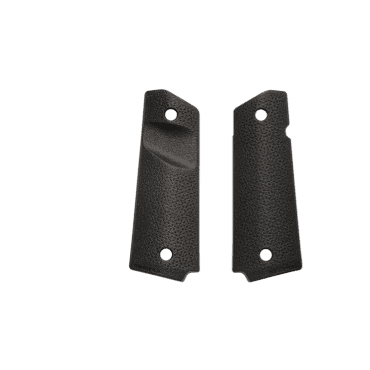 The Magpul grip panels are an affordable modification that we'd like to see every 1911 user take advantage of. They'll make firing your weapon more comfortable, ensure that you have less of a risk of dropping the weapon from sweaty hands and improve your accuracy passively by helping you maintain an excellent grip on the pistol. They can come in several colors depending on what you like best. A good barrel will give direct improvements to your accuracy, even if your mechanical skill stays the same. When in competition against newer firearms, any extra accuracy you can squeeze out of the gun is a win in our eyes. You can either go for a gunsmith fit barrel or a match-grade pre-fit barrel. The former is a better deal since your accuracy will be much better, especially at farther ranges. This barrel will improve the accuracy of your 1911 immediately. As soon as the first shot is fired, you’ll be able to tell a great difference in the range at which you can reliably hit targets. The barrel has a threaded interior, which means that it’s going to help spin your round as it exits the gun and maintains its accuracy over a longer space. Velocity won’t be helped very much, but we’re looking at barrels for their accuracy improvements more than anything, and the 1911 has enough velocity that this shouldn’t be a problem anyway. 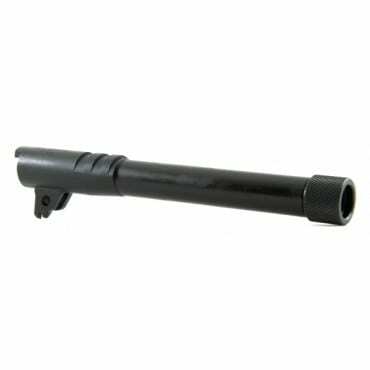 The barrel is also designed to allow you to install some additional accessories on its front, such as a suppressor. We really like attachments that play well with others. This barrel is a great addition to any modification suite you’re planning for your 1911 since it can be combined with other attachments and make your firearm even more of a force to be reckoned with than it already is. This barrel does a phenomenal job of improving the accuracy and effective range of your 1911. While you will suffer a slight velocity reduction, the threading in the barrel will spin each round issued by your 1911 and cause them to hit targets further and more accurately than ever before. It’s also easy to combine with other adjustments due to its shapely construction. Most original-style 1911s will have small, mil-spec sights that might not compete with the better optics afforded by many modern pistols. Instead, you can add much better sights that will allow you to shoot more accurately and in better lighting conditions than the standard set. There are both fixed and adjustable sights available for your 1911, depending on your preference. Here we have an excellent government-style sight that you can mount atop your 1911 with a minimal effort or trouble. We recommend using a gunsmith just to be sure the mounting goes perfectly, but it’s an easy-enough piece to take off if you need to adjust something or if you don’t want the sight on for a particular shooting session. The sight uses a tritium dot that's bright enough to work in most low-light conditions. This is great for use with a 1911 sight since you might use the pistol in urban or interior quarters during tactical exercises. The dot isn't very ideal for high-light scenarios, although in this case having a sight to aim your shots more precisely is still going to be a net benefit for your firearm. 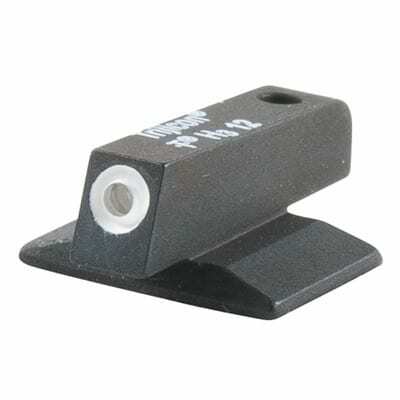 The sight is made from durable materials and is mounted on the dovetail, a perfect location for a 1911 sight. The price is pretty reasonable for all of the functionality you get with the purchase and its easy modifiability means that even if your first mounting isn’t perfect you can tinker and mess around with it until you’re satisfied. It’s a great example of an attachment sight for an older weapon. This dovetail sight is very easy to install and remove, so you can switch up your weapon depending on your mood on any particular day. The sight is particularly helpful for shooting in low light environments and is balanced and weighted very well: a critical component for a lightweight pistol attachment. The 1911s recoil can be tricky to learn. As an older weapon, it certainly has a bit of a kick that takes some getting used to! You can add a decent compensator to reduce the muzzle rise as you rise. This will redirect the recoil rather than reducing it. In this way, you can improve your accuracy and keep your barrel on target even as you squeeze off multiple shots in rapid succession. The Parrish is a great compensator that’s presented for an affordable price. It’s very easy to install; you won’t need to go to the gunsmith and wait for very long before you can have your piece installed and ready for action. Right away you'll notice a solid difference in recoil control as you squeeze off rounds. 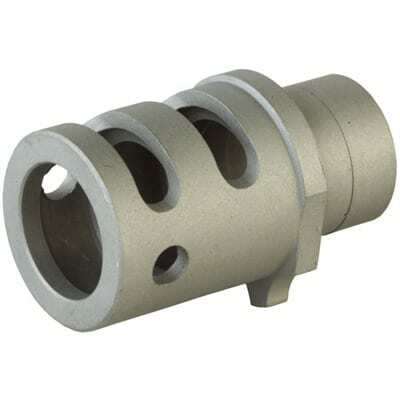 The compensator is well-made and well balanced and is treated with a coating to resist heat damage and the corrosion that can come with that effect. It's pretty lightweight, so you shouldn’t notice much of a difference before and after you install it onto your 1911. Most importantly, your shot won’t be thrown off by having to adjust to a new balance or tilt to the feel of the firearm. The only tiny flaw we found is that the color likely won’t match the metal shade of your 1911 right off the bat, but with a little paint beforehand you can take care of that quickly enough. Or you can just ignore it; you’re getting the compensator for its performance boost, not its appearance. If you want to control your 1911’s recoil and make staying on target easier with quick, successive shots, we can’t recommend the Parrish enough. This compensator is so easy to install you won’t even need to consider the gunsmith. You can remove or attach it as you please and immediately feel the results as your 1911’s recoil is handled much more vertically than before. This will help you place shots where you want them, and it works with all calibers of rounds suitable for a 1911. It’s also been treated to resist heat and corrosion. Many 1911s could benefit from a little trigger work. This will allow you to improve your trigger's pull quality and improve your accuracy passively since each trigger pull will jostle the weapon less intensely in your hand. A trigger upgrade will likely need to be performed by a good gunsmith, but you'll see immediate results and really feel the age reduction once the upgrade is complete. Let’s take a look at a great trigger from PSA for a 1911 specifically. It’s made of aluminum. This is to keep the trigger durable, yet light enough to both not distort the balance of the gun and to ensure that each trigger pull is smooth and buttery. It’s a far cry from triggers made with bulkier, thicker metals that have difficulty sliding past other machine parts. The trigger is a three-hole variant, so there are a multitude of sensitivities you can specify for your particular weapon. In general, we like sensitive triggers because they translate to better response time and better accuracy since you'll be pulling the trigger less hard and shifting your gun less as a result. Don't worry about a trigger that's too sensitive if you're good on your safety training and always have your safety on unless you're about to fire. Because modifying your trigger affects the whole gun and a bad installation can have ramifications that might break the weapon, we recommend heading to a gunsmith to make sure that the trigger is installed correctly. While this might take time and money, we feel that you’ll really love the improved performance of your 1911’s trigger. 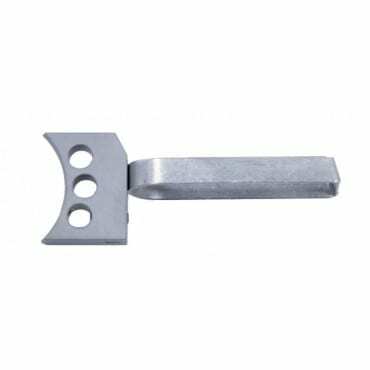 This great trigger is light and made of aluminum. This affords it some supreme durability without compromising its ability to smoothly slide past the other parts of the gun, making each trigger pull satisfying and consistent. You will need a gunsmith's help for effective installation, although the three-hole style allows you to specify the kind of sensitivity you want for your ideal 1911 trigger setup. With all of these upgrades, you can imagine how well your 1911 will perform in the field. It’ll be like a new gun, but with the solid, steady core of a trusty 1911 pistol. With these upgrades, you won’t need to say goodbye to your reliable 1911, you can keep it with you through the years, confident that it will take care of business just as well now as it did decades ago.